This is the perfect comfort food dish, packed with warming flavours. Sweet potatoes are baked until tender and soft, and the inside is scooped out, mashed with butter, black pepper and salt, and popped back in when it’s beautifully fluffy. It’s finished off with chicken breast marinated in a sweet chilli sauce, made with Chilli Pepper Pete’s New Mex Red, fresh avocado, melted cheese and coriander. 1. Preheat the oven to 200˚C (180˚C fan). Give the potato a bit of a scrub, then rub with olive oil. Place on a baking tray and put in the oven for about 90 minutes. 2. Next, rehydrate the Chilli Pepper Pete’s New Mex Red chilli. Simply place in a bowl, pour in enough hot water to cover, and leave for ten minutes. 3. To make the sweet chilli marinade, remove the stalk and seeds from the pepper, roughly chop it, and put in a blender with the ginger, the rehydrated Chilli Pepper Pete’s New Mex Red, the sugar, and a generous splash of olive oil. Blend until you have a smooth paste, adding a bit more olive oil if it’s too dry. 4. Chop the chicken into bite-sized pieces, pour the marinade on top, and give it all a good stir. Set aside for the moment. 5. When there’s about fifteen minutes left on the timer for the baked potato, pan-fry the chicken until cooked through and just starting to turn golden. 6. Once the potato is done, slice it open lengthways and scoop out the middle. Mash with a splash of milk, a generous scoop of butter, and plenty of salt and black pepper, until nice and fluffy, then spoon back into the skins. 7. 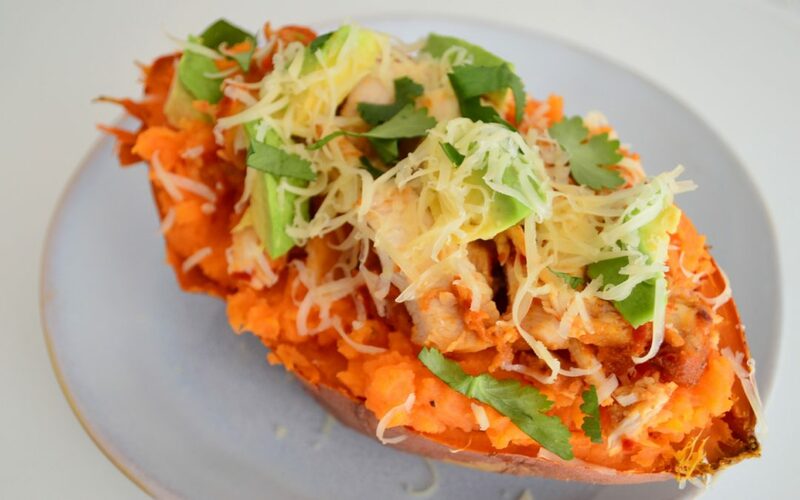 Finally, top each half of the potato with the chicken and grate over plenty of cheddar. Finish off with chopped fresh avocado, fresh coriander and a final sprinkling of black pepper.